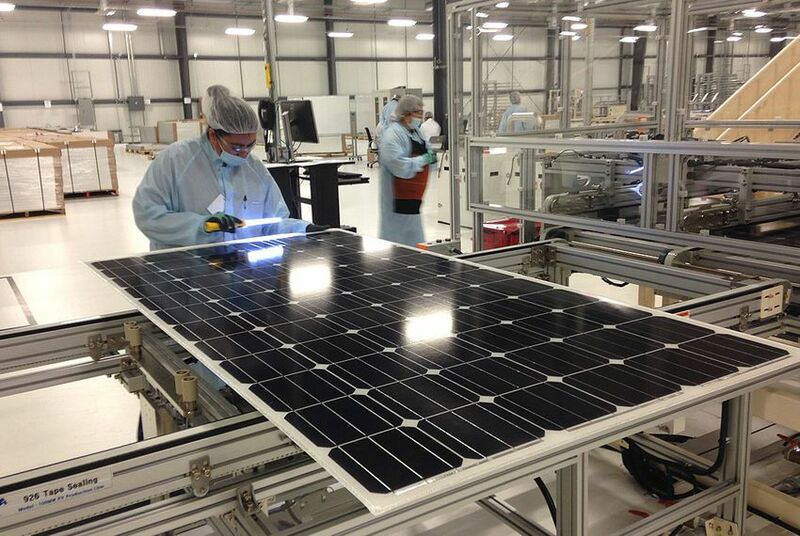 Texas’ biggest solar panel manufacturing plant is ramping up production. It’s part of San Antonio’s effort to become a solar energy hub – by building solar farms to help power the area and luring the companies that manufacture their parts. SAN ANTONIO – Under a flood of fluorescent lights on a factory floor that looks more like a hospital operating room, dozens of workers clad in surgical caps, gowns and masks feed silicon wafers through machines along an assembly line. Over an 18-hour process, those machines will inspect each cookie-sized wafer for chips or cracks, etch them and bake them with gases, then give them a reflective coating — before workers piece them together on panels that could power the state’s clean energy future. This is the scene inside Texas’ biggest solar panel manufacturing plant, which is ramping up production after becoming fully operational over the summer. Built on the former site of Brooks City Air Force Base, the 24,000-square-foot factory is the product of the city’s effort to become a national hub for solar energy — by building solar farms to help power the area and luring the companies that manufacture their components. The city’s plan – spurred by a unique partnership between CPS Energy, its municipal utility and a solar power provider – has quietly brought in hundreds of jobs and millions of dollars in investment. It is enabling San Antonio to transition away from coal-fired power generation and helping Texas become a national leader in the industry. “The fact that this plant has opened in Texas most likely underlies a growing confidence that Texas will continue to expand its solar portfolio in the future,” said Ken Johnson, a spokesman for the Solar Energy Industries Association, which is based in Washington, D.C.
Mission Solar Energy, a joint venture of OCI Solar Power and Korea-based Nexolon, runs the Texas manufacturing plant, and its business is humming because of a deal it signed with CPS Energy in 2012. Under the agreement, OCI Solar promised to build the Alamo Project, a 400-megawatt series of solar farms in Texas that CPS Energy could tap at a fixed rate over the next 25 years. That type of “purchase power agreement” is common in the energy world. What wasn't: OCI Solar's agreement to bring at least 800 permanent jobs to San Antonio and invest at least $115 million locally. To fulfill its commitment, OCI Solar moved its headquarters to San Antonio and teamed up with Nexolon to open the factory that each day cranks out as many as 10,000 solar cells, which convert sunlight into electricity. For the next two years, many of those cells will become part of Alamo – the state’s biggest solar project. Mission Solar is the only U.S. company that makes the increasingly popular "n-type" panels, which are more expensive but more efficient than the more commonly used "p-type" model. The company has also formed partnerships with manufacturers of smaller components of solar systems. For instance, KACO New Energy, a German company that manufacturers inverters – devices that convert direct current (DC) electricity generated by the solar panels into alternating current (AC) electricity that powers homes and businesses – moved its North American headquarters from California to San Antonio solely because of the CPS deal. Through April 2014, 378 employees had been hired at San Antonio solar firms or relocated there, and those new companies have invested $105 million in local construction and $1.2 million in education initiatives, according to a report CPS Energy commissioned. The report projected that the effort would deliver 1,045 new jobs by 2019. Though those job numbers are just a fraction of what development on the oil-rich Eagle Ford Shale just south of San Antonio has brought to the region, solar advocates are excited that the project has helped kick-start the state’s long-untapped solar industry. Because of its size and intense radiation, Texas leads the nation in solar energy potential. The industry has long struggled to get a foothold in the state, as policymakers have provided fewer incentives than other states, and solar energy currently makes up a tiny percentage of Texas' energy portfolio. But improving technology has driven down the price of solar power, making it more competitive with other resources­ – even without extra incentives, developers say. That trend has sparked what some industry experts describe as a small “land rush” in West Texas, and it has convinced executives at CPS Energy that solar is workable. Still, not all leaders in Texas have emphasized solar as a path forward for Texas. In a report last week, for instance, Texas Comptroller Susan Combs derided renewable energy sources such as wind and solar as unreliable (the sun doesn't always shine and the wind doesn't always blow) and too expensive, saying that long-term contracts for solar energy could lock utilities into rates that might look too high in the future. And getting Mission Solar running quickly has carried its own set of challenges. In July, the San Antonio Express-News reported that some of its workers complained about the conditions – including brown water and a lack of available restrooms – while the plant was still under construction. The company said it has since fixed those problems. CPS Energy, which plans to retire one of its oldest coal plants ahead of schedule, has set a goal of using renewable energy to meet 20 percent of its electricity demand by 2020, with at least 100 megawatts of energy derived from renewable resources other than wind. Beneby, who declined to share how much the utility is paying for the solar energy, said the deal with OCI Solar guarantees a client for the manufacturer, investment in the local economy and a clean power source that won’t be curtailed by looming federal Environmental Protection Agency regulations. Though the San Antonio City Council last year allowed the utility to raise its electric and gas rates by more than 4 percent, CPS Energy, which touts a high credit rating, offers some of the lowest rates in the state, according to Public Utility Commission data. Mission Solar is not the first solar manufacturer to set up shop in Texas. A much smaller manufactuer called 1SolTech operates in Irving, just outside of Dallas. But it has run into legal troubles. Attorney General Greg Abbott last year filed a suit against the company, alleging that it had imported cheap Chinese panels and sold them as if they were made locally. The company has denied the allegations. And Austin-based HelioVolt, which made thin-filmed solar panels, halted its operations and laid off more than 100 employees this year after losing backing from its investors. The company was the recipient of a $1 million grant from the Texas Enterprise Fund, which is facing increased scrutiny in recent days after a state audit said the fund was riddled with weak oversight policies. Executives at the San Antonio manufacturer – which has not received a state grant – say the guaranteed demand from CPS Energy should help the company avoid a fate like HelioVolt's. Beneby said he wouldn't be surprised to see other utilities pursuing similar partnerships with solar companies, and he said he has taken calls from executives across the country who are interested. Are any of those calls coming from Texas? “Let’s just say all over the U.S., and Texas is a part of the U.S,” he said. Editor's note: An earlier version of this story said incorrectly that Mission Solar Energy's solar panel manufacturing plant was the only such plant in Texas. This version has also been updated to include information about 1SolTech, a smaller panel manufacturer based in Irving.